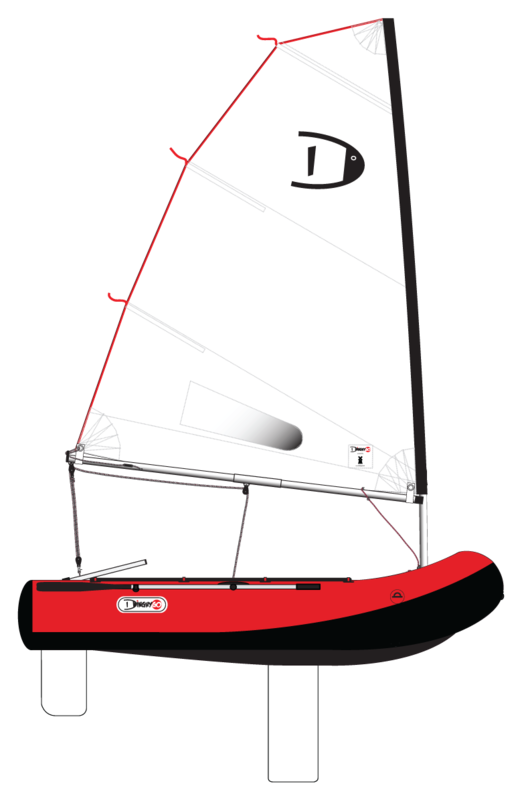 DinghyGo Nomad 3 allround inflatable sailboat including kick-up rudder, sail-kit, owners manual and instruction video. Boat dimensions: - Length: 9' (2.75 m) - Beam: 4'9" (1.50 m) - Draft: 2'8" (0.85 m). Boat capacity (maximum): - Number of persons: 4 - Payload: 500 Kg (1,100 lb.) - Outboard engine: 4.5 kW (6 Hp). Sailing rig dimensions: - Mast length: 11'3” (3.45 m) - Boom length: 6'7" (2.05 m) - Sail area: 42 sq.ft. (3.90 m2). Packing size and weight boat: 40 x 21 x 13 in., 27 Kg (1.00 x 0.54 x 0.32 m, 60 lb.). Packing size and weight sail/row-kit: 47 x 20 x 6 in., 14 Kg (1.20 x 0.50 x 0.16 m, 31 lb. ).